Breakfast, Sunset Harbour Cruise, Buffet Dinner, Drinks, Overnight Darwin Accommodation. Enjoy a tour of this great city before a Welcome Reception and dinner with your Travel Director and travel companions at Wharf One. See the sights of Darwin such as the Old Parliament House and the new Northern Territory Parliament building on your city tour. See some of the devastation caused by Cyclone Tracy and enjoy a Welcome Reception with Dinner at Wharf One overlooking the Darwin Waterfront. Breakfast, Darwin City Tour, Dinner, Overnight Darwin Accommodation. The glistening jewel in the crown of Northern Territory's Katherine region is Katherine Gorge (Nitmiluk) National Park, the landscape is a wonderland of rugged sandstone cliffs, cascading waterfalls and dense rainforest, a cruise along the spectacular Katherine Gorge offers sensational views of the gorge's towering sandstone walls. Breakfast, Katherine Gorge Cruise, Dinner, Overnight Katherine Accommodation. The vibrant town of Kununurra lies on the eastern edge of the vast and beautiful Kimberley, the region is blessed with a wealth of incredible natural beauty, towering gorges, cascading waterfalls, inviting rock pools, rivers and creeks, amazing flora and abundant wildlife, attractions include boat cruises, fishing, Aboriginal art and hiking. Set on the eastern edge of the remote Kimberley region of Western Australia, Kununurra is a small and busy town surrounded by wonderful natural attractions and a ruggedly beautiful landscape, attractions include Lake Argyle, Lake Kununurra, Diversion Dam, Celebrity Tree Park and the lookout Kelly's Knob which offers sensational views. The Gibb River Road offers a chance to embark on one of Australia's last true outback adventures, it takes you through 660 km of simply sensational typically Australian surrounds, towering ochre gorges and escarpments, beautiful cascades, inviting plunge pools, majestic rivers, spectacular ranges and vast bushland savannahs. El Questro is situated in Western Australia's beautiful and remote Kimberley region, this vast homestead and wilderness park is over one million acres in size and is largely unexplored making it one of Australia's last frontiers, experiences on offer here include barramundi fishing, horse trekking and scenic helicopter flights. The Argyle Diamond Mine in Western Australia's Kimberley region is the world's largest single producer of diamonds, the mine has been in operation since 1983 and has produced more than 800 million carats of rough diamonds, it is one of the most technologically developed mines in the world and is renowned for its sensational pink diamonds. Breakfast, Argyle Diamond Mine Tour, Lunch, Dinner, Overnight Halls Creek Accommodation. Breakfast, Yiyili Indigenous Community Tour, Lunch, Geikie Gorge Cruise, Dinner, Overnight Fitzroy Crossing Accommodation. The small outback town of Derby lies 222 km from Broome in the beautiful Kimberley Region of WA, this charming town is rich in cultural diversity and has a proud indigenous culture, the town is surrounded by a wealth of natural attractions including the Horizontal Falls and Windjana Gorge, town attractions include Old Derby Gaol and Prison Boab Tree. Take a step back in time to Broome's fascinating pearling history on a visit to Pearl Luggers in the heart of bustling Chinatown, guided tours and stories immerse you in the pearling culture of Broome, see two perfectly restored pearl luggers full of artefacts and pearling memorabilia including diving suits and helmets. A camel ride along the beautiful expanse of Cable Beach's pure white sands offers an unforgettable and thrilling experience, this iconic Broome attraction is a must do experience, as the sun goes down and you're led across the waters edge the glorious pastel pinks and molten golds of Broome's legendary sunsets offers sensational views, don't forget your camera! Breakfast, Choice of Included Sightseeing, Overnight Broome Accommodation. The Pilbara region of Western Australia is home to one of the worlds most ancient and dramatic landscapes, towering canyons shelter inviting plunge pools, Karijini National Park's majestic gorges never fail to impress, the hundreds of stunning islands and the white sand beaches of the Dampier Archipelago are just made to explore. Travel South from Broome to the Pilbara region, famous for its diverse landscape and vast mineral deposits. Skirt the edge of the Great Sandy Desert, see large pastoral leases and cross Aboriginal homelands through Pardoo before reaching your overnight accommodation in Port Hedland. Breakfast, Dinner, Overnight Port Hedland Accommodation. Karijini National Park situated in Australia's North West is blessed with an incredible rugged natural beauty which is just made for exploration and adventure, swim under cascading misty waterfalls, walk and hike through ancient tunnels and gorges and take a dip in natural spa pools, enjoy sensational views of the park from the heights of stunning Mt Bruce. Breakfast, Dinner, Overnight Karijini Accommodation. Karijini National Park is blessed with an incredible wealth of stunning natural beauty, Western Australia's second largest National Park is home to majestic towering gorges, cascading waterfalls and glistening rock pools, the parks abundance of indigenous wildlife includes red-kangaroos, rock-wallabies and echidnas. Visit Fortescue Falls at Dales Gorge and walk to one of the park’s plunge pools, travel to Tom Price and visit Rio Tinto’s Open Cut Iron Ore Mine site. See the huge machinery in action before retiring to your overnight accommodation at Karratha. Breakfast, Lunch, Guided Tour of Rio Tinto Open Cut Iron Ore Mine, Dinner, Overnight Karratha Accommodation. Exmouth is Western Australia's underwater playground, home to the stunning Ningaloo Reef which is a top destination for divers, swimmers and snorkellers, the crystal clear waters are ideal for sailing and kayaking, swim with the world's largest fish, the whale-shark, and discover the rugged natural beauty of Cape Range National Park. This morning head west towards Exmouth, located on the boundary of the Cape Range National Park and the Ningaloo Marine Park. Visit the Vlamingh Head Lighthouse for stunning views of Lighthouse Bay, experience a tour of Exmouth township and stay at the Novotel Ningaloo Resort overlooking Exmouth Gulf. Tonight enjoy an included dinner with wine. Breakfast, Exmouth Township Tour, Lunch, Dinner, Overnight Exmouth Accommodation. Toda, enjoy free time to explore. If nature permits, you may like to view Whale Shark as you swim alongside them in the pristine waters of the Ningaloo Marine Park, alternatively you could take a stroll along the beach, or relax by the hotel pool overlooking the water. Ningaloo Reef on Western Australia's Coral Coast is a magnet for divers and snorkellers drawn here by its crystal clear waters, exquisite coral gardens and abundance of spectacular marine life, swim with the world's largest fish, the whale-shark and giant manta rays, spot for migrating whales, dugongs and turtles and relax on secluded white sand beaches. Breakfast, Ningaloo Reef Glass Bottom Boat Cruise, Dinner, Overnight Carnarvon Accommodation. Located in the Shark Bay World Heritage Area, Monkey Mia is a must-see for nature lovers, every morning a pod of friendly bottlenose dolphins swim close to the beach in the shallow waters of Monkey Mia to interact with enchanted visitors, under supervision you can feed and touch the dolphins in what is a unique and unforgettable wildlife experience. Breakfast, Shell Beach Tour, Dinner, Overnight Monkey Mia Accommodation. Experience a magical encounter with the friendly bottlenose dolphins at Monkey Mia, this up close and personal experience lets you see first hand these beautiful creatures in their natural environment, feed them and touch them under supervision in what is a simply unforgettable and unique interactive wildlife encounter. Breakfast, Monkey Mia Dolphin Interaction (Not Guaranteed), Optional Shark Bay Scenic Flight, Optional Wildlife Cruise, Overnight Monkey Mia Accommodation. The coastal town of Kalbarri lies six and a half hours drive north of Perth, the towns stunning coastal surrounds offer great opportunity for fishing and surfing as well as whale watching in season, Kalbarri National Park is home to the Z Bend walking track and spectacular Nature's Window lookout which offers fantastic views of the Murchison River. Breakfast, Kalbarri National Park Tour, HMAS Sydney Memorial Tour, Overnight Geraldton Accommodation. The thousands of ancient limestone rock formations that make up the Pinnacles are an incredible natural phenomenon attracting tens of thousands of visitors a year, situated in Nambung National Park close to the town of Cervantes these eerie spires rising from the yellow quartz sands are both mystical and impressive and are a favourite subject for photographers. Breakfast, Pinnacles Desert Tour, Aboriginal Cultural Experience, Dinner, Overnight Perth Accommodation. Bid your new friends farewell when your West Coast holiday concludes after breakfast. Rottnest Island offers an endless array of wonderful things to see and do, this beautiful island just off the coast of Perth has sensational beaches, a wealth of cycling and walking trails, abundant wildlife, historic sights and spectacular scenery, the island's clear blue waters are ideal for snorkelling, diving, fishing, sailing and swimming. Today experience a scenic cruise to Fremantle and the Indian Ocean, whilst enjoying your Special Buffet Lunch. See the city skyline, Kings Park, millionaire's row, giant sand spit and the bustling historic port of Fremantle. Choose from a selection of wines or beer to accompany your delicious Special Lunch and enjoy morning tea. Margaret River combines one of the world's premier wine and food regions with one of the world's best surfing locations. It's Western Australia's popular and high profile holiday playground. Many visual treats are on offer here including the dramatic coastline, calm sandy bays, massive caves, seasonal wildflowers and Busselton Jetty, the southern hemisphere's longest jetty. The beautiful Margaret River Wine Region is a taste of paradise for food and wine lovers. Sample world-class wines such as sensational shiraz, exquisite chardonnay and scintillating sauvignon blanc which are produced here in its many picturesque, boutique wineries. Culinary gems include irresistible hand-made chocolates and mouth-watering cheeses. Each year Margaret River hosts the world surfing championships. Leaving Perth on your transcontinental adventure across Australia to Sydney you're embarking on one of the world's great train journeys, the view from your cabin window offers up a visual feast, the lush greens of the Avon Valley, the vast treeless plains of the Nullarbor and the rugged beauty of the Blue Mountains are just some of the incredible highlights. See below for full details on your Indian Pacific journey. 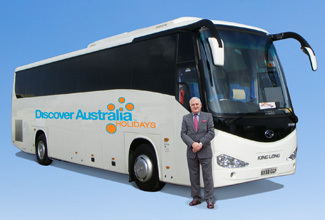 Note: passengers disembarking in Adelaide depart on Day 32. As you arrive into Sydney you can feel the rush and hustle-bustle of this major cosmopolitan global city. You will be personally met by a DISCOVER AUSTRALIA representative and transferred from the railway station to the airport to meet your flight home. Breakfast, Meet and Greet Personalised Rail Transfer, 3 Nights Gold Service Cabin on the Indian Pacific (2 Nights ex Adelaide), 3 Breakfasts, 3 Lunches, 3 Dinners, Luxury Kalgoorlie Coach Tour (Perth to Sydney customers only), Luxury Adelaide Coach Tour (Perth to Sydney customers only), Luxury Broken Hill Coach Tour, Meet and Greet Personalised Departure Transfer. You have 3 choices of accommodation in Darwin and Perth. Our "Good Standard" central hotels have great facilities, a comfortable room and friendly service (typically 3.5 stars). Alternatively, why not treat yourself? The "Deluxe" hotel has superior facilities, stylish room and first class service (typically 4 stars). The “Luxury” hotel is upscale with a more luxurious feel for the discerning traveller and great for celebrating an anniversary (typically 5 stars). 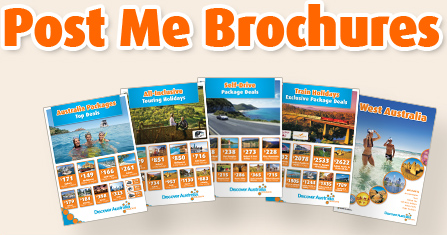 You’ll receive the FREE DISCOVER AUSTRALIA Bonus Voucher Book that includes $500 value of discounts and bonuses throughout NT and WA at shops, restaurants attractions, wineries etc. It’s a great way to save even more on your holiday. The indulgent Platinum Service cabins are nearly twice the size of Gold Service cabins and come with premium fittings. The large panoramic windows give you the best seats onboard the Indian Pacific plus you have an interior window to give you views of both sides of the train at the same time. During the day, your cabin will be configured as a private lounge, with deluxe lounge seating, a table and two ottomans. By night, it is converted to a comfortable bedroom, with either a double bed or twin beds. Platinum Upgrades start at $1600 per person. All packages can be upgraded to include luxurious Platinum Service, simply ask. 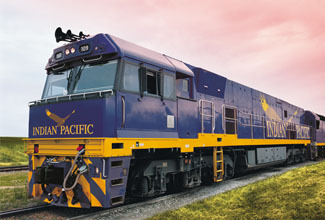 The Indian Pacific with West Coast, Kimberley, Broome, Darwin & Territory Luxury Touring is very popular. Many dates book out well in advance, please book soon.